The group Kilusan at Alyansa ng mga Dating Rebelde, composed of former communist rebels, has called on the country to not celebrate the founding anniversary of the New People’s Army on March 29, saying the men and women killed fighting with and for them could have become responsible and useful members of society. This developed as Cagayan Governor Manuel N. Mamba expressed joy on the return of former members of leftist groups to the government in oath-taking rites at the provincial capitol last week. 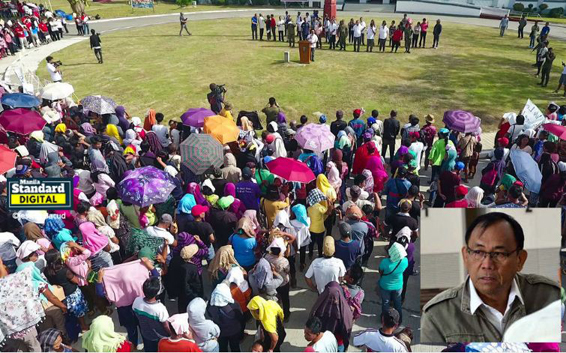 The governor led more than a thousand members of Anakpawis and other left-leaning organizations in an Oath of Affirmation of Support to the government on Friday at the Provincial Capitol grounds in Alimanao Hills, Peñablanca. “I will ensure good governance for your trust and confidence to the government,” Mamba stressed. Ka Louie, who was a professor in a well-known university, said Apol became his student but was later killed in an encounter in Tanay, Rizal. Ka Louie lasted eight years in the underground movement from the 1980s until 1990. He became the chief of the CPP Regional Youth in the National Capital Region before deciding to bolt the armed organization to finish his studies. Louie said Apol was one of his students and he was surprised when he later learned that she was a member of the communist movement. People in the movement offered the women to be Political Officers of the NPA in Rizal and conduct rural integration work, but Ka Louie told the two to finish their studies and slow down their participation in the communist group. “I knew that the CPP-NPA’s power and popularity is dwindling and is eventually becoming a group involved in gangsterism,” he said. Czes believed Ka Louie and decided to finish school, but Apol went on and joined the NPA in the mountains, causing their friendship to break. According to Ka Louie, Apol was angered why Czes chose education and to uplift the lives of her family rather than joined the armed movement. Currently, Czes is the head executive assistant of a sitting senator and is currently pursuing a law degree. Apol, Ka Louie noted, was involved with the NPA’s terrorism, land-grabbing, and extortion activities. She was later killed in an encounter with the armed private group of a politician. He said Apol’s body was displayed in a town plaza to remind locals that joining the NPA has no protection and security, always ending in tragic circumstances. Louie and Czes vowed that through KADRE, they will do whatever it takes to convince the youth not to waste their lives in joining the NPA, and there is nothing to celebrate in its formation.